Just in time for the New Year - well, okay, a couple of days early, but that just gives you more reading time - Harry's Cat is waiting for you in Issue 10 of The Literary Hatchet. As you tuck into your New Year's feast (or your Christmas left-overs), Harry's Cat is a digestive treat for those suffering from an overindulgence of kitten cuteness on Facebook and other social media sites. Harry's Cat is a brand new short story from J.S.Watts. 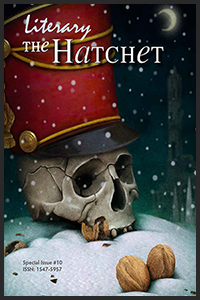 It appears in Issue 10 of The Literary Hatchet, along with a festive banquet of stories, pictures and poems from some fantastic writers and artists, and you can download it for free here .